"The nineties" means something specific in comic book history, and it does not sneak up on us. 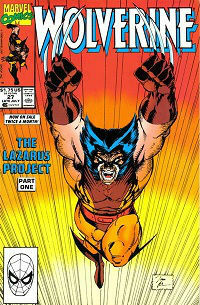 Right here in 1990 we have the pre-Image creators on core books, variant covers, gratuitous guest appearances, more titles, and multiple cross-overs. Todd McFarlane gets his own book, Jim Lee is on X-Men, Rob Liefeld is on New Mutants, and Erik Larsen is on Amazing Spider-Man. 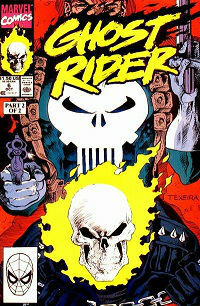 A new Ghost Rider series is launched. There is still a lot to appeal to fans of the previous era, though. Walt Simonson's Fantastic Four run is one of the highlights. Peter David's Hulk keeps getting stronger, especially after Dale Keown becomes the artist. Jim Starlin returns to Marvel with a run on Silver Surfer that begins building up to next year's Infinity Gauntlet. John Byrne begins runs on Namor and Iron Man (the latter with John Romita Jr. on art). Quasar delves deep into Marvel continuity. 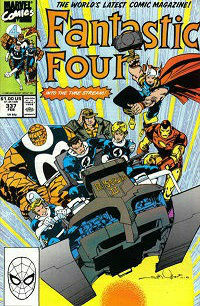 But the Avengers goes into a holding pattern after John Byrne leaves. Iron Man is in fill-ins for a good portion of the year and it's a similar situation with Excalibur. Mark Gruenwald's Captain America run starts to stall. Some books, like Power Pack, Cloak & Dagger, and She-Hulk, really ought to have been cancelled (the first two eventually will be, and John Byrne will give the third a brief reprieve next year). Many books feel like they exist just to exist, including several one shots that are undeserving of their prestige format (and high price tags). And that's before we get into the dumping grounds of Marvel Super Heroes and Marvel Comics Presents. Dwayne McDuffie steps down as assistant editor on special projects to become a full time writer (starting with a Deathlok mini-series). He is replaced by Tom Brevoort. Fabian Nicieza moves up from fill-ins to become a regular writer, and a prolific one: New Warriors, Alpha Flight, Nomad, and Avengers, plus stories with Rob Liefeld in Marvel Comics Presents. Gerry Conway's run on the secondary Spider-Man books comes to an end. Steve Gerber begins a 10 part Foolkiller series. Louise Simonson is pushed off of New Mutants, and soon leaves Marvel. Chris Claremont is similarly losing control of X-Men. Regular books remain at $1.00 this year. There is still a separate category of books that remain priced at $1.50. Annuals remain at $2.00. Special format minis and oneshots, comparable to annuals in page count, can be $3.95 - $4.95 per issue. Annual crossovers include The Terminus Factor, Lifeform, Spidey's Totally Tiny Adventure, and Days of Future Present. There is also the mutant-only crossover, X-Tinction Agenda. Thanos returns in Silver Surfer and acquires the Infinity Gems in Thanos Quest. Code: Blue, a police force dedicated to dealing with super-villain threats, is introduced in Thor's comic.